Every book starts as an idea. In this section we will see how and where the book idea originates. We will see how the idea becomes a book later. The idea or spark for the book usually comes to the author. It can be the desire to share your knowledge or to teach others the things you have learned the hard way. You might have seen many books on your area of expertise and have the confidence that you can do a better job. You must have collected information for your own use which you think might be useful to others like you. We will see some typical scenarios. You are an expert on a subject. You have spent years learning the ropes, becoming proficient and mastering the subject. You have years of real- world experience. You are considered as a guru in that subject by your colleagues and peers. You are consulted whenever there is a problem. In the years you have learned and practiced the subject you have encountered almost all situations and challenges that possibly could occur. You know that you can contribute to the field by sharing the knowledge. You know that you can write an interesting book as you have more than enough funny and interesting anecdotes that will hook the readers. You know that you can explain things in a jargon free manner which people understand, as you have been doing that all along. You have enough credentials and professional standing to make people want to read your book when they hear you are the author. So you decide to write a book on your subject of expertise. A book idea is born. You have completed several projects that involve developing high-technology products. You know how to successfully manage such projects where new advances happen every day. You know how to hire brilliant people and how to manage them, and how to make them work as an efficient team. You have experienced the challenges, fallen into the traps and pitfalls, faced the obstacles—human and technological, and you have learned how to look for them, steer clear of them and bring the projects to successful conclusion. Your experience—both successes and failures—could help young project managers to avoid the traps, pitfalls, and obstacles. You think you can write a book that will shorten the learning curve for beginners. Another book idea is born. You are a teacher and you are not satisfied by the textbooks that are available in the market. In your opinion they don’t do justice to the subject and don’t explain the concepts clearly. You know that your combination of practical and teaching experience makes you an ideal candidate for writing a book that will explain the concepts with the help of real-world projects. It will be a textbook that will help the students to learn both the theory and its practical applications. So you decide to write a book mainly to teach your students, but could be used by other teachers and those who want to learn the subject. Yet another book idea is born. You might have collected a lot of information during the course of your career. The information is hard to find and is from many different sources which are not readily accessible. You have collected, collated, and organized the information so that it is easy for people like you to get all the information needed to complete your job from your compilation. You know that no such book exists in the market. You are sure that it will be well received by people in your profession. You decide to turn your work into a book. Another book idea has come to life. You have written a book on a general subject. But each chapter of that book is broad and deep enough to be a separate book. For example, you have written a book on Database Systems. But the different chapters of the book like Relational Database Management Systems, Data Normalization, Relational Algebra, Data Mining, Data Warehousing, etc. are topics can be written as separate books. In the general book, you have given a condensed view of the important topics. But in a separate book you can be more comprehensive and include all the advanced and complex topics that you have left out. The audience of the general book and the advanced book will be different. But writing one general book can ignite the spark for several books. Similarly, writing an advanced book can kindle the idea for a general book or a book on the same topic for a different audience. Once the author has an idea and has the confidence of turning the idea into a book, then he/she will have to find a publisher who is willing to publish the book. 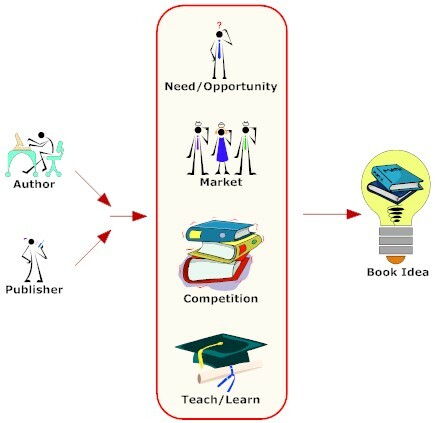 With the popularity of Internet and WWW and the availability of new publishing media and technologies, one can write, publish, market, and sell the book. We will see about this later. Sometimes the idea for a book will come from the publisher or one of the commissioning editors or the editorial board at the publishing house. While browsing the catalogue the publisher or editor finds that he/she does not have a book on a particular subject or for a particular market segment. For example, a publishing company who specializes on Computer Science books might want to publish a book on Software Project Management or Software Configuration Management, if it doesn’t have a book on that subject. Sometimes the company might have a book on a particular topic but it is targeted at advanced readers. So the company might want to publish books for the beginner and intermediate markets. If the book idea has idea occurred to the publisher, then the publisher will have to find a suitable author.